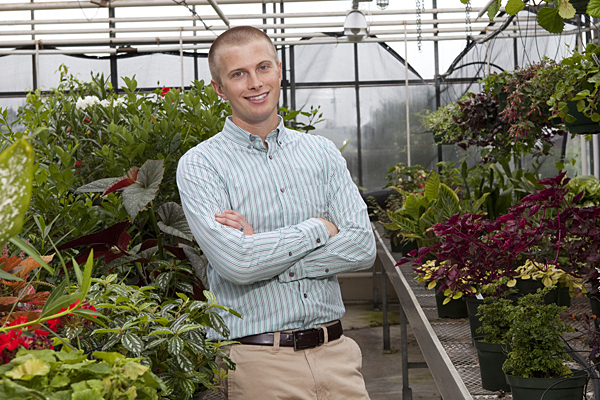 Josh LeMonte, a first-year doctoral student in the Department of Plant and Soil Sciences, has been awarded a prestigious SMART Scholarship from the Department of Defense. 8:21 a.m., Sept. 9, 2011--Josh LeMonte, a first-year doctoral student in the Department of Plant and Soil Sciences at the University of Delaware, has been awarded a prestigious Science, Mathematics and Research for Transformation (SMART) Scholarship. The SMART Scholarship for Service Program, part of the National Defense Education Program of the U.S. Department of Defense (DOD) and administered by the American Society for Engineering Education (ASEE) and the Naval Postgraduate School, provides opportunities for both graduate and undergraduate students to pursue degrees in science, technology, engineering and mathematics and be gainfully employed upon graduation. As a SMART scholar, LeMonte will receive approximately $350,000 in support over five years as he completes his Ph.D., which includes tuition, books, health insurance, paid summer internships at a DOD research facility and a stipend. In return, he has committed to a minimum of five years of employment with the DOD following the completion of his degree. LeMonte earned his bachelor’s and master’s degrees in environmental science at Brigham Young University in Provo, Utah. While he was studying there, a professor introduced him to Mark Chappell, a DOD scientist working on solid phase chemistry of environmental contaminants at the U.S. Army Corps of Engineers’ Engineer Research and Development Center in Vicksburg, Miss. Chappell encouraged him to apply for the scholarship and will serve as LeMonte’s mentor in the program and supervisor of his summer internships. LeMonte, who arrived at UD in May to work in the lab of Donald L. Sparks, S. Hallock du Pont Chair of Soil and Environmental Chemistry, says his research is still in its infancy. This work will make LeMonte an active member of the Christina River Basin Critical Zone Observatory research team, which is examining human impacts on the movement of carbon atoms through the watershed ecosystem. It will also require him to travel occasionally to national laboratories to use the synchrotron spectroscopy instrumentation available there.